I did a blog post a little while ago about getting real work done on a Surface 2 (ARM & RT) and I've learned a few interesting things since then. The Surface 2 has a great screen. Having 1920x1080p resolution screen on 10.6" screen is really fantastic. In fact, the DPI on the Surface 2 is so nice that working on any other machine (like the 13" 1366x768 laptop I'm writing this on right now) is just unacceptable. NOTE: This isn't specific to Surface 2. It works on the first Surface Pro, or really, any 1080p or above Windows 8.1 machine! However, the default DPI settings for both Store Apps and Desktop Apps is set too high, which scales everything and in my opinion this limits you in a few ways. 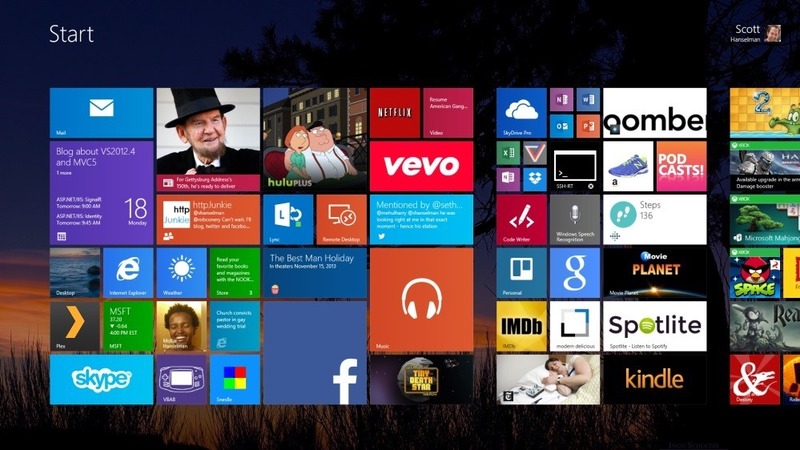 You see fewer tiles on the start screen and can't snap/see more than two Store Apps at a time. If you don't mind smaller on-screen elements, here's a few tricks that will take your high-resolution Surface 2 to the next level. It did mine. Here's my Start Screen with the default settings as the Surface 2 shipped. From this Setting screen, change the Default setting to "Smaller." Here's the Start Screen now with the size set to Smaller. But wait, there's more. Now, go to Settings (Windows Key+C) and click Tiles, then Show More Tiles. Now my Start Screen has smaller tiles, but lots more. It's nice to have options. 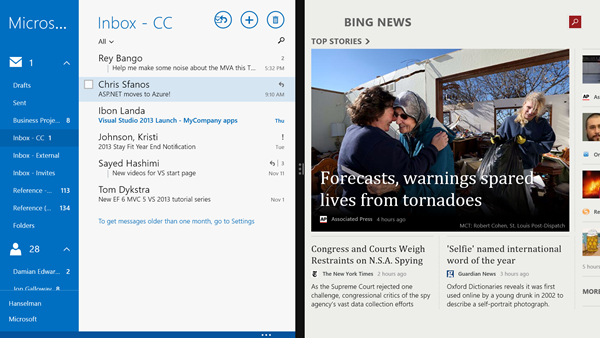 Here's Mail and News snapped next to each other using the Default DPI setting on the Surface 2. After changing the setting to Smaller, I can now pull a third application in and the others will get out the way. With 8.1 apps I can resize them to more sizes than 8.0 apps. I prefer the smaller Full Screen/Store DPI setting because I can now read email, check web pages and watch a movie at the same time. I can also bring the Desktop in and run apps over there at the same time I have other Store Apps. Here I'm running Excel on the Desktop, next to Mail, next to Hulu. After changing Full Screen/Store DPI settings, don't forget you can also changed the DPI for Desktop apps as well. 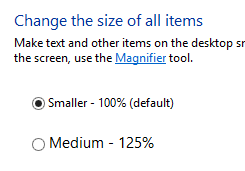 Right click on the Desktop and click Resolution, then "make text and other items larger or smaller." You can play with the settings and find what works. These desktop settings do not change your Store Apps. I hope these tips help you push your own Surface (or any high-DPI laptop) harder. Sponsor: Thanks to Red Gate for sponsoring the feed this week! Easy release management: Deploy your .NET apps, services and SQL Server databases in a single, repeatable process with Red Gate’s Deployment Manager. There’s a free Starter edition, so get started now! So now in Windows 8.1 we can - depending on screen size and resolution - show more than two apps side-by-side. Isn't that amazing! But looking at your example with lots of black real-estate above and below the video, it is obvious that this is not yet the ideal solution. I wonder if somebody can come up with a better and more flexible paradigm, perhaps something with rectangular areas that we can freely configure, move and resize? How about we call them "Windows", and create something like a "Desktop" where we can arrange those "Windows"? Oh, wait - that sounds somehow familiar. Could it be that somebody already invented that? Seriously: Scott, I appreciate the info that you are providing here, and I realize that this is way outside of your area of influence. But I find it ironic - in a deeply disturbing way - that we apparently have to go through a few iterations of new Windows releases, just to re-invent a concept that has been available since Windows /286. Peter, you can use overlapping windows on the desktop all you like on Windows 8.1, or is there anyone pointing a gun at you and forcing you not to? You can even have them on the Surface! I have to say I doubted the usefulness of "metro" apps on big screens, but they actually work great. Even more so on multiple screen setups, where you can have the "metro" apps on one screen so you can keep an eye on them at a glance (Mail, Facebook, Twitter, Skype are obvious candidates for this), and whatever else you want on the other(s), it can be more "metro" apps, the desktop or even a mix of either -- you can even have multiple desktops. The fact that they simply snap into place and you don't have to fiddle with the size so they're not on top of each other is the killer feature, but then again, I was already a fan of aero snap. If there's one thing that can be said about the Windows 8.1 UI it's that is way more flexible than your regular overlapped Windows. Brilliant. 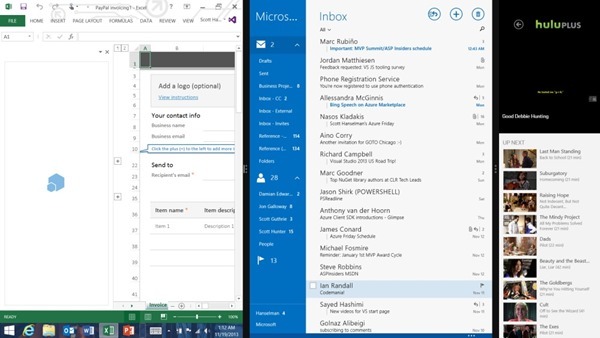 This has solved some of the quirks with running two apps side by side in metro (kindle and OneNote). Keep the usability tips coming! Carlos, I realise that the Desktop works as it always has in Windows 8 and 8.1. I am also very happy with my Surface Pro - but I find that I practically do not use any Metro-Apps ever. 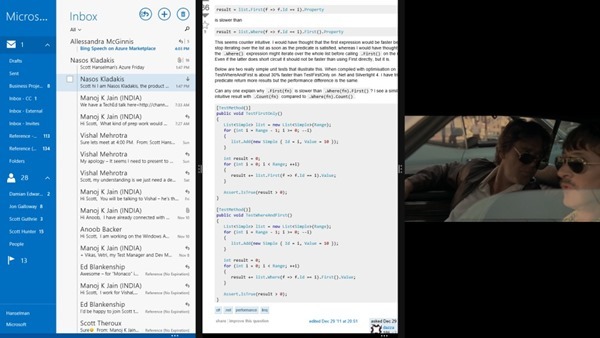 As an Example: I also may want to read email, check a webpage, and watch a movie at the same time (just like in Scott's sample screenshot). But in that case I certainly do not want to waste a third of the screen for the movie - of wich two thirds are black (top and bottom). For me the Overlapped-Window-Mechanism works best - but I realise that this is somewhat a matter of taste. What I don't like about Metro is that I no longer have that choice, and do not have the flexibility that I am used to on the Desktop. Any ideas on why I only have the options; "Default" & "Larger" for the first tip? I'm running dual 1920x1200 screens and, of course, 8.1. Thanks for the tips either way. Excellent article, I just did this on my Surface Pro 2. So nice to have VS 2013 snapped next to a browser for code snippets. It would be great if they could figure out how two snap VS tabs to the sides. Would be almost like working on dual monitors. Is there any way to use more of the large margin/border around the tiles? I'd prefer edge to edge tiles. 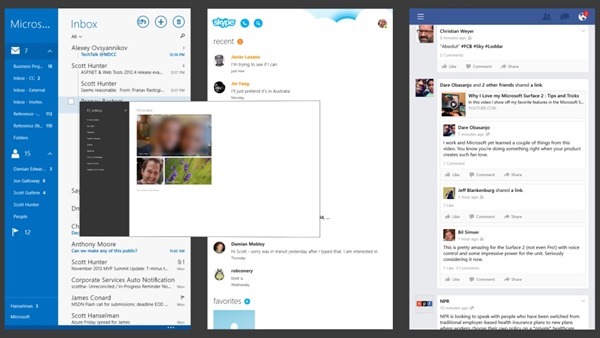 I am also a huge fan of the high DPI screens, a healthy trend. The jokes about an overlapping windowing system are fun and understandable. But truly, when you've used an iPad as long a I have, I don't really want to be able to resize iPad apps. I want to run them side by side, picture in picture, and snap them around. I (and Atwood, surprisingly) like automatic window management. It frees you from a LOT of minute window resizing. I use Divvy on my Mac. I know the next metaphor that works best, but I'm keeping it to myself until either one day I get up and read that someone else had the same brilliant idea, or someone at Microsoft realizes my genius and hires me on the spot (I was banking on Hanselman getting the CEO gig). Needless to say, the current path is a regression (and everybody knows it). Apple has gotten into Microsoft's head. Innovation does not mean re-invention (or knocking off the competitor). It means taking your advantages to the next level. Right now, I suspect I'm the only person on earth that knows what that next level is (or everyone at Microsoft is keeping their great ideas in their briefcase until things stabilize). @David Birch: I think it might be because it defaults to "smaller" if your resolution is high enough. I don't have concrete proof of that but I'll post back when/if I do. Waiting on my Dell Inspiron Core Duo to die before getting a Surface Pro 2. @Scott About automatic window management, it reminds me awfully on xmonad project in Linux community. Scott, the jokes about an overlapping window system are not fun. They're depressing. It's really, really sad how little Microsoft seems to care about desktop users any more. The Windows 8 "modern" interface is completely pointless on a desktop, especially one with multiple large screens; Skydrive was completely screwed up in Windows 8.1, and the idea of logging on to a desktop PC using an online account is ludicrous. I want to stay a Microsoft customer and Windows user, but I feel like Microsoft is actively driving me away. "I prefer the smaller Full Screen/Store DPI setting because I can now watch email, check web pages and watch a movie at the same time." I really wonder what is the point? Seems to me that you already have to many windows open as you should read emails not watch them. I'm always taken by surprise with the hatred that change creates in people, especially in an industry like IT were it's constant and part of the culture (at least I thought it was). And then it's less comprehensible when, in the case of Windows 8.1, things don't have to change at all. Install a Start Menu extension and you've got yourself a faster Windows 7. Done. No need to read any further. I have no interest in change for the sake of change and I see no point in regressing to a less functional solution but at the same time I have many different use cases for the technology I use and not all of them are served by the current offerings. For example with my Surface on the lounge chair the Modern interface is great, at a desk a combination or Modern and Desktop works well. I also know there's many learned behaviours I've picked up, as a result of working around an issue or just because I had the freedom, that aren't productive or what I would consider good. For example I can have 10 or 20 things open on the desktop at once but rarely do I get more value from those 10 or 20 things than I would from just the 2 or 3 I actually need at that time. I'm even looking at Scott's example of email, web browser and a movie and wondering if I'd be able to give enough attention to all 3 to make it worthwhile. It would also be helpful to include how to change the default zoom level in desktop Internet Explorer which, at least on my Surface Pro, is pinned to 150%. Thanks for this, Scott. It was good to catch up with you at the summit this week. I'm afraid I haven't had any success with this at all. I'm running Windows 8.1 on a Sony Vaio Pro 13 ultrabook (1080p) and when I go to the 'size of the apps' section the 'smaller' option shrinks all the interface elements (rather than just the tiles). And for some reason I could not find a 'Tiles' option at all under settings -- it simply didn't appear. 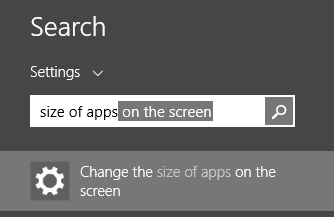 I can't find this "change the size of apps on the screen" setting on my Surface 2. I've tried searching for "size" and just doesn't show up. My Surface 2 is completely updated, latest BIOS, Windows Update, etc. 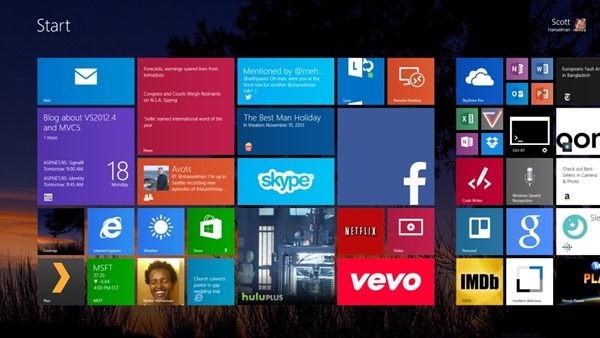 Also, the "show more tiles" setting is there on my Surface 2, but not on my laptop (Alienware 17"). Scott- Thanks for the info! Question, do you know if you can create tiles for your home page? The app store is missing a lot of the daily programs I need and use. Can I just create a link that I go directly to when I click on a tile? What are my options, besides going to an internet browser manually or not using those apps on here just on my IPhone? Thanks! The part that says, "Now, go to Settings (Windows Key+C) and click Tiles", should say Windows Key+I instead. "C" is for Charms, from which you still have to navigate to Settings. "I" (Information) takes you directly to Settings. 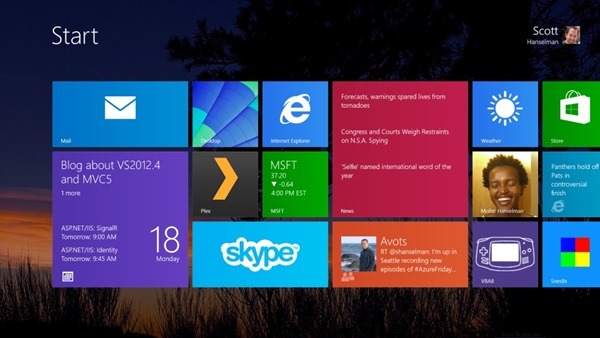 great tips and top apps for Windows 8.1 Laptop. hope students as well take advantage of this option. how we can resiz them to wide or large ? my web site support live tile but this tile is just in medium or small size ? please help me how to resize it to large ? But excuse me for not getting excited about only being able to run three programs in unscalable windows. As a Windows user for many years (since version 3.1) I have been able to run dozens of programs on my Windows screen for some time - in fact since 3.1. Just wonderful. I use windows 8.0 after i see this upgrade windows 8.1 then i change my mind today i was upgrading my windows..